Pamela died in May 2014 as the result of a sudden, ferocious and untreatable brain tumour. Matthew Tomalin (Pamela's husband) is keeping the website up, to both record and celebrate Pamela's work. Born in Devon, Pamela lived for many years in Wales where her studio looked out directly at the landscape which was so influential in her work. The same visual and technical threads ran through both her silversmithing and jewellery, combining subtly curved forms with textured surfaces in a variety of finishes. Her first workshop was established in the 1980s; from then on she produced jewellery and small objects in many materials including resins and silk-screened PVC, but metals always claimed priority, especially silver. A few years ago she began working at a larger scale, and silversmithing became an important part of her practice. A continuous preoccupation was landscape in all its moods, big spaces with tiny details; most recently, the ambiguity and shape-shifting nature of the light on the hills. This was not landscape as pastoral idyll, but a place bearing evidence of continuous layers of survival. Pamela�s recent work continued to explore these themes, beginning with drawings and prints, before translating her ideas into metals. 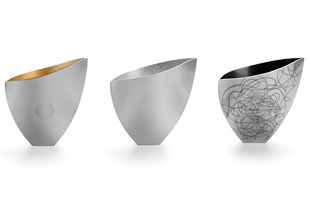 Her expressive vessel forms in silver, designed to stand alone or in groups, were complemented by small collections of jewellery that expressed the drawn line. Both strands of her award-winning work have been exhibited nationally and internationally, and are represented in both public and private collections.